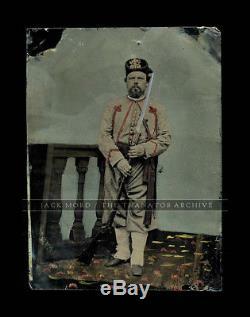 Original full plate (8.5" x 6.25") tintype of an armed Civil War Zouave. Tintype has normal bends and dings associated with these larger, loose tintypes. Soldier rare photograph tin type antique photo photography marine navy naval picture history historic 1860s uniform nbsp. The item "Rare full plate painted tintype armed civil war soldier / zouave" is in sale since Sunday, December 10, 2017. This item is in the category "Collectibles\Photographic Images\Vintage & Antique (Pre-1940)\Tintypes".